Response card: Matching white heavy mulberry cardstock. Response envelope: Translucent English vellum A2 size (4-3/8x5-3/4)OR recycled A2 envelope with celery colored mulberry paper envelope liner. **Discontinued - Retired ** We loved you, Lily and so sorry to see you go!!! Eco DIY Wedding Invitations - perfect for two language or multi-page formal invitations. DIY Square Invitation letterpress printed drawing in celery green ink. Made from heavy mulberry unryu paper. 100% PCW milkweed envelopes. This is a very green wedding invitation for earth-friendly weddings. Finished invitation measures 6" x 6"
Elegant booklet of beautiful heavy mulberry paper from the mountains of Thailand. We letterpress print the cover in celery green ink. Invitation is book style. Invitation Sheet: Matching mulberry printing sheet. Prints inkjet or laser beautifully. Invitation Printing Sheet:Matching heavy Unryu mulberry paper - prints inkjet and laser beautifully. 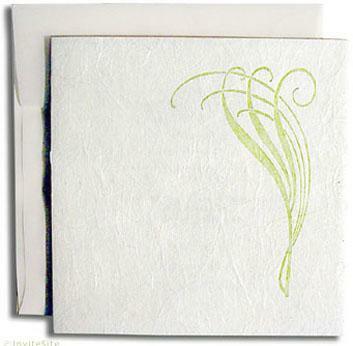 Inner Envelope:Translucent English vellum square envelope. Templates in Microsoft Word if you plan to print these yourself.